← Are Airstrikes Imminent in Iran? 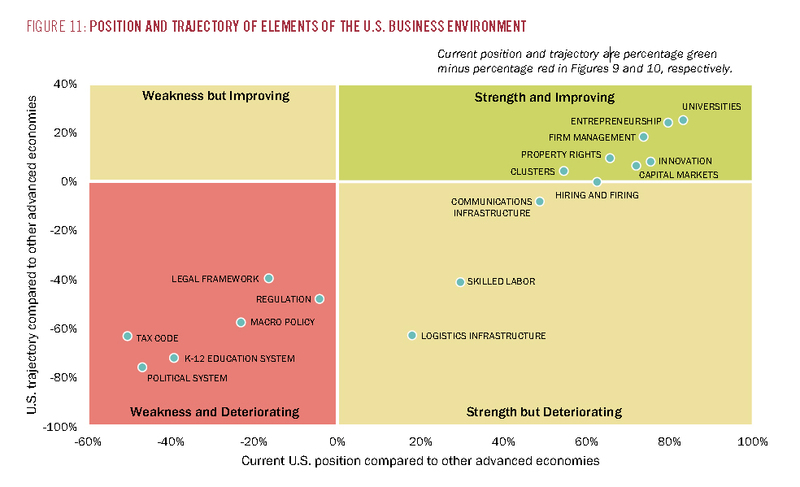 Last October I was among nearly 10,000 Harvard Business School alumni who completed an in-depth survey on American competitiveness. Harvard Business School released the results of this survey last week, and they are fascinating. The results are important to note, because many of the respondents are in key positions of authority at their organizations and thus will make a significant impact on these organizations’ strategies over the next decade, particularly in employment decisions affecting thousands of people. 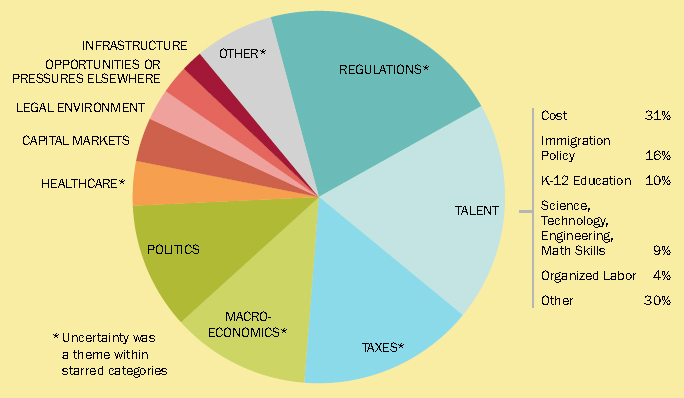 The survey makes it clear as to the factors America’s business leaders really think are negatively impacting job creation in the United States – regulatory uncertainty, taxes, uncertain macroeconomics, politics, and talent issues (cost, immigration policy, skills, and education). It seems business leaders view government not as the solution but as responsible for the majority of the country’s declining competitiveness. This entry was posted in Business, Education, Finance and Economics, Healthcare, Leadership, Policy, Politics, Taxes and tagged Harvard Business School, Jan W. Rivkin, Jobs, Jobs Policy, Michael E. Porter, Prosperity at Risk, Prosperity at Risk: Findings of Harvard Business School's Survey on U.S. Competitiveness, Regulations, Regulatory Uncertainty. Bookmark the permalink. Rick, it appears to show that only 26% were in finance & insurance, and I think of that only a portion of those are actually on Wall Street. To your point, however, I think if you polled small business owners with non-Ivy-League educations and much lower salaries (assuming) I think the voting would fall along the same lines with the same concerns being paramount. Even if much of this was sentiment, we know what sentiment does to the marketplace so I would agree that the results here are significant. I think someone must have kicked Rick’s puppy today, Vern. Haha! Sounds like it. You’d think he’d be happy – Newt won! Oh, boy. Then he won’t like my next post. Therefore, I think it’s pretty much an open invitation to anybody. I’m not surprised that education was on their list. Our public schools are more interested in indoctrinating students in liberal socialist philosophy than in teaching them useful life skills. They teach what to think instead of how to think. Parents need to remind school officials that they work for us, not the government or the teachers unions. Education funds should be divvied up equally among students, X- amount per child regardless of that child’s economic status or ethnicity. Then those funds should follow the student wherever he chooses to attend school. This would force schools to improve in order to compete for students and their money. I would like to see what solutions these businessmen propose. What are their takes on issues such as the Fair Tax, unions and education reform. Just what would it take for these businesses to stay here and expand. Other than a change in the White House of course. If you click on the report, they actually have some solutions for government which are fairly interest. It is near the end of the report. I read the report and it was very enlightening. I still would be interested in a report that focused on business owner’s opinions of specific reforms. Yeah, and a bunch of Catholics were polled and surprise surprise, they liked the Pope. THe most laughable part was when they complained “workers’ living standards (were) under greater pressure than firms’ success”. In other words, we’re supposed to go back to 19th -century working conditions. Lovely. News flash, you’re not SUPPOSED to compete with totalitarian regimes. You’re supposed to treat them like the old Soviet Union, isolate them. Instead, you make your enemies stronger and yourselves weaker by trading with them. Reeeeaaaallll bright. Yeah, FoxConn Factories, a blueprint for America. Riiiigggghhhhtttt. The second most laughable is the idea that the US is overregulated. Maybe you missed a little something called the financial crisis? Deregulation has been a disaster everywhere it’s been tried, be it Californian electrical companies, Wall Street, or offshore drilling. On the other hand, plenty of countries with more stringent regulations are outperforming you economically..Canada, for instance. You’re obviously of the mindset that people deserve jobs based upon nothing other than the fact that they breathe. I of course disagree, but that’s another argument. On the Canada vs. U.S. regulation vs. deregulation thing, I actually agree with you to a large extent. The U.S. believes in much more freedom than Canada does, which put another way means it has fair less restraint in a lot of areas that Canada doesn’t. When the U.S. wins it wins big, and when it loses, it loses big. Consider,that the U.S. is 10 times as large, however, so the pendulum is going to swing much farther either way than it would in Canada before it reaches the optimum point between regulation and free market. Let’s keep in mind that Canada follows in most areas – we don’t lead. That gives us the luxury of being able to sit back and watch what everyone else does and then decide later what to pick and choose to implement as our own, and thanks to the U.S. we have the luxury of being able to sit back and watch in economic and military safety. You don’t think Russia would be doing more sabre-rattling right now over our northern territory? You don’t think China would be trying to do more in the oil sands? You think our workers would be just as safe working in places like Iraq and Libya if it weren’t for the U.S.? Thanks largely to the U.S., we have the luxury of avoiding much of the risks other countries face, so in my opinion, they’re not perfect, but in many ways we should be thanking them and regarding them as true partners, not scolding them in some classic b.s. liberal parental tone sitting up high on some horse that for the most part, is a horse that they handed to us. Lastly, if you really want to get into the “we’re better than they are” argument re: the financial sector and business, please look at the entire picture and have at least half a clue as to what you’re talking about before you start flapping. You’re quoting Enron? Take a look at which bank was the biggest backer of Enron. Yes, U.S. financial de-regulation $hit the bed and played a heavy role in the current financial crisis. No one argues that. However, U.S. banks still do far more for small businesses than Canadian banks do and if Canada wouldn’t be so prone to OVER-regulation of certain areas, they’d have a lot more companies staying domestic and growing locally instead of moving down south where even in spite of the economy the conditions are far more friendly towards small business than they are up there. What part of Canada are you from, anyways? Canada does not lead? WRONG. When people want to know how to have a universal coverage health care system without breaking the bank, they look to us. When they want to know how to build a financial system strong enough to withstand the most idiotic of business decisions, they look to us. When they want to know how to mine and forest without wrecking the environment, they look to us. They don’t look at you anymore. In fact, you’ve become an illustration of what NOT to do. The world is laughing at you. For a minute, it looked like you’d actually learned something, but now, it looks like you’re going to put the same bunch of idiots in that made your mess in the first place, because Obama couldn’t solve your problems with a snap of his fingers. They laugh at you and your pathetic crop of GOP candidates. The only thing you lead in is how to go from being a superpower to a laughingstock in thirty short years. As for military protection, we really would be in trouble if we relied on your brutish incompetents. We’ve proven that we can stand up in Afghanistan, where we defended your country for you while you were busy making the world safe from Haliburton. In any case, we’re twenty minutes away from having a working nuclear weapon. Think on that in case you get any ideas. And dude, we DO have more companies staying domestic because we were smart enough not to sell out to the Chinese. And our small companies are doing far better than yours. That’s why our unemployment rate is lower than yours and our markets stable. Face it sell-out, we’ve got you beat. We’ll be standing strong when you’re planting potatoes in your backyards to stay alive. As to what bank was the biggest backer of Enron, what difference does that make? It wasn’t them that did the funky bookkeeping, they were just another victim. It’s only because of America’s past success that Canada has had a market to sell to for so long, genius. Once again you miss the bulk of what I and others have said on these issues and instead are obviously just America-bashing to feel all tough for once in your life. And “sell out”? Really? First of all, enlighten me on what you really do in your life to promote Canada or make it better. I hope to God for your sake it goes beyond trolling. Second, lay your job out here, (if you even have one). If you want to really enter this discussion, enter it full on rather than sniping from some anonymous perch. So it’s “Military Expert Shannon” and “Small Business Expert Shannon”, now, is it? We’re a country of 35 million people selling into a market of 350 million people just in the U.S. alone. It doesn’t take a genius to make that math work. On the larger end of things, take any of our largest employers and show me how many are truly Canadian-born companies. if they are, you’ll quickly find heavy government protection in place due to the simple fact that these companies wouldn’t have survived against any sort of real competition. Telco’s – you’ve got the CRTC. Airlines – you’ve got Transport Canada. Television and Media? You’ve got the CRTC again. Now, if you want to actually argue that Canada’s protectionist policies have worked you could make a really good case that I’m sure others would be happy to discuss here, but that’s not what you’re about, is it? Instead, you’re just the “I do nothing to grow our country but I’ll still run around and act morally superior to the rest of the world” attitude-holding idiot that’s nothing short of a total embarrassment to any Canadians living and working abroad.